You are currently browsing the tag archive for the ‘artists’ tag. Your scenes are there forever. Had an incredible Q and A last night with Mark Pudleiner. He said some really inspiring things that any artist can relate to. How many creative things have you started that never were finished? When Mark asked us this generic question last night, I truthfully answered, “Probably about 90% of my stuff.” Basically what he was trying to show is that, every creative person, whether it be a writer, painter, animator, director, editor, all have these doubts in themselves, because we are out most critical eye. As artists, we are always trying to out-do ourselves and push our stuff to the limits to get the best results. He wanted us to realize that these doubts about the quality of our work is all very natural and normal. As an artist, it really does help to hear these things. Sometimes art can be a very lonely thing, even in such a collaborative field like animation. Luckily for me, I’ve got this incredible community of people who are all in the same place I am. Each one of the students at Animation Mentor have a passion to create this illusion of life, and every single one of them is on this same journey I am on trying to find out where we fit in this incredible expressive art form. After such a great Q and A, I finally cracked open my copy of “The Illusion of Life” by Frank Thomas and Ollie Johnston. I’ve been on this animation path for so long, I figured it’s about time I read the book that most people in the field consider to be the “bible” of the art form. The way they talk about animation is beautiful. After reading only one chapter, I’ve already got tons of pages in my notebook with quotes. I can’t wait to finish it. On that note, I turned in my last version of my first shot for my Advanced Body Mechanics class. It definitely still needs a lot of work, but Mark told me in my eCritique that the shot made some incredible leaps and bounds from where it was, and according to him good progress like this is a great success, even if the shot isn’t perfect. So I wanted to share it with you all! Last week, I also turned in some planning for my next shot. I haven’t started the blocking yet in Maya, but the last couple of days I’ve been studying my video reference and trying to do some extra sketching. I’m hoping this extra preparedness will help my shot start off nice a solid, so I won’t have to work backwards too much like I feel like I have done in most of my shots. In other news, I finally downloaded the software for my printer/scanner! (Yay!) This means I’m going to be scanning in some fun old pictures (after I’m done with my AM assignments, of course!). I scanned one in earlier today for a test. Here it is, submitted for your approval! 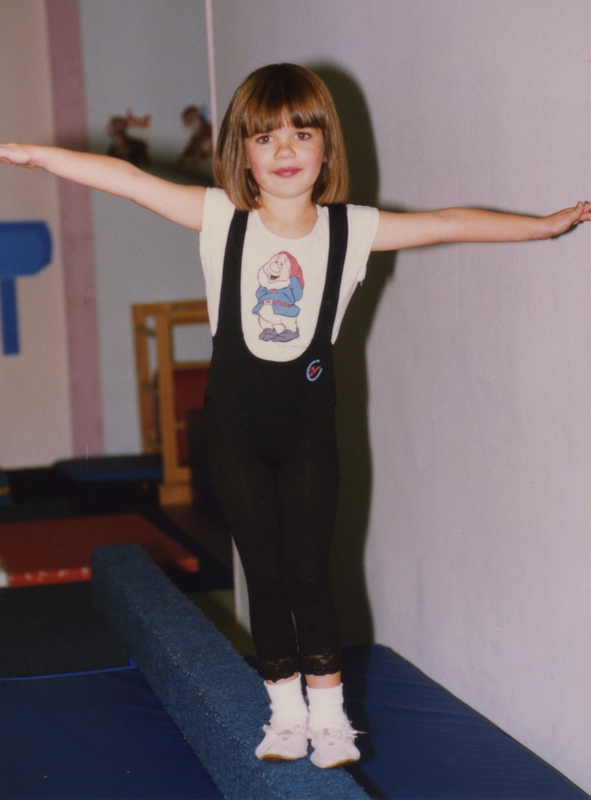 Snap shot from my Totnastics days.